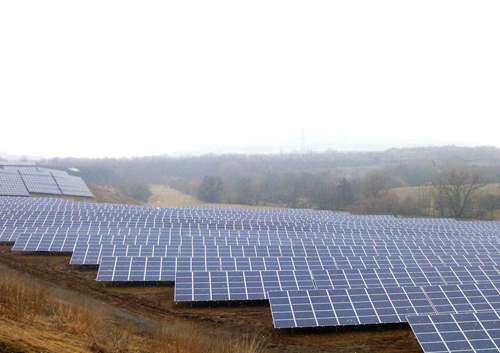 As of May 2013, the 7400 PV modules of the Dreimärker solar park in Heuchelheim, Hesse/Germany, deliver 1.8 Megawatt of solar power to the public grid. A solar park with 7400 PV modules was created in the north of the town of Heuchelheim. After the nature protection authorities gave their go, the foundations were laid on February 18, 2013. Despite the difficult weather conditions in February and March, the solar park was connected to the grid in late April. The town of Heuchelheim contracted Wagner & Co Solar Technology from Cölbe, Hesse, with the turnkey implementation of the solar power plant, including planning, project implementation and the delivery of all components. The solar company draws on more than 30 years of experience and already carried out numerous projects of similar scale. The newly established limited project corporation “Dreimärker Solarpark GmbH & Co KG” operates the power plant. The city council of Heuchelheim is a founding partner and commissioned the „Solardach Invest GmbH“ to manage the new company. For many years Solardach Invest, a member of the Wagner Solar Group, successfully operates solar power installations on public and commercial buildings. Many residents of the Heuchelheim community are keenly interested in the new solar park and thus Solardach Invest decided to offer various alternative routes for private investment engagements in the corporation. The Heuchelheim city council scheduled a meeting on June 6, 2013, to decide about the different possibilities of citizen participations from Heuchelheim and beyond. Bilddownload 1: As of May 2013, the 7400 PV modules of the Dreimärker solar park in Heuchelheim, Hesse/Germany, deliver 1.8 Megawatt of solar power to the public grid.